How do plants help you sleep better? We’ve researched and written about sleep teas and infusions before here at Good Night’s Rest, and we’ve even reviewed some natural supplements that use plant extracts as their main ingredients. However, ingestion isn’t the only way to benefit from plants. Apart from their medicinal purposes, plants also naturally purify air, as they absorb carbon dioxide and release oxygen. Dry air is also less likely with plants around! There’s also the aesthetic effect; something about having greenery around is just relaxing and calming, for some people at least. If there are fragrant flowers added into the mix, that might help, too. No green thumb? You may go the aromatherapy route instead and rely or using essential oils or a custom dream pillow. If you’re a budding plant enthusiast, though, it may interest you that some species of plants can eliminate significant amounts of toxic agents that may be found in indoor environments. The latter is the focus of this article. We looked at the NASA Clean Air Study in particular as a reference for this list of easily found house plants that can be kept in the bedroom. The toxic agents that these plants remove from the air in your house—benzene, formaldehyde, trichloroethylene (TCE), toluene, xylene and ammonia—are chemicals that come from common household items. You may not realize that they’re even there! For example: Benzene, formaldehyde, toluene, xylene may all be present in furniture and other wooden and painted products. Formaldehyde and toluene are present in cigarette smoke. Ammonia and TCE may be present in cleaning products. The bottom line is that even the most cautious and conscientious homeowner can benefit from having air-purifying plants around the house—especially in the bedroom, where clean and properly humidified air is paramount for better sleep. Below is a list of our five favorite bedroom plants. We’ve also added some alternatives, in case you don’t find these specific ones at your local gardening store or plant nursery. Pro tip: If you have pets and small children around the house, you may want to stick to non-toxic plants, or greenery that you can hang very high and out of harm’s way. 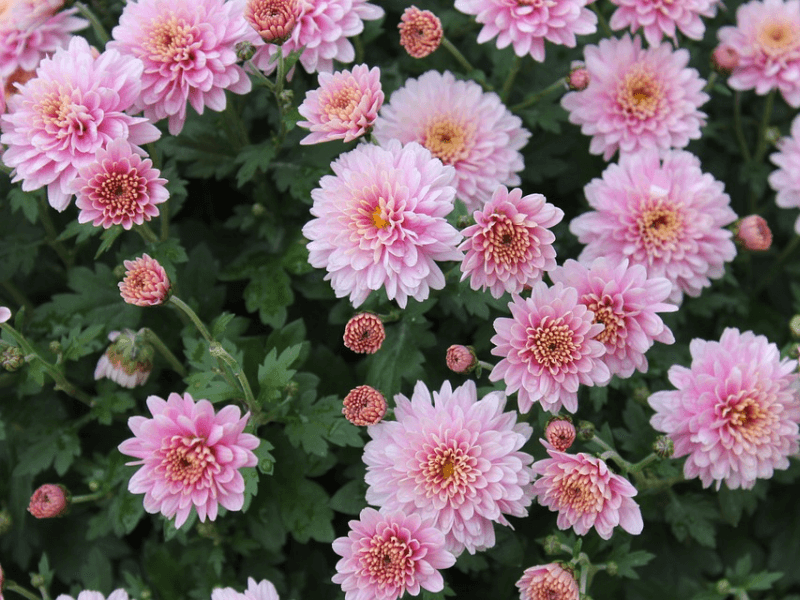 The Florist’s Chrysanthemum is a perennial plant that is not only useful indoors, but is very beautiful and decorative, as well. Its long-blooming flowers that come in many colors: lavender, orange, red, white and yellow. Apart from purifying household air, you can count on the Florist’s Chrysanthemum to add that punch of color to your bedroom! Needing moderate maintenance—partial sunlight, medium moisture—it also grows at a moderate pace. The NASA Clean Air Study lists the Florist’s Chrysanthemum as one of the most effective at removing toxic agents in household air. Its only downside is that it is toxic to household pets like dogs and cats. Alternative/s: Gerbera jamesonii or the Barberton Daisy is another air-purifying plant with colorful flowers: orange, pink, red, white, and yellow. Overall, it is less effective than the Florist’s Chrysanthemum, but it does have the advantage of being safe for pets. Like the Florist’s Chrysanthemum, the Peace Lily also topped the NASA Clean Air Study. This perennial plant is an evergreen with large and broad leaves, and the flowers come with a spathe that’s typically white—sometimes with a greenish or yellowish hue. Native to tropical regions of Southeast Asia and the Americas, the Peace Lily does not need a lot of sunlight or water in order to survive. You can even tell when it needs a bit of water, as it will sag a little; and it’s been known to thrive in rooms with only indirect sunlight, or no windows at all! The plant’s resilience makes it a favorite for indoor plant enthusiasts, beginner growers and plant store owners. 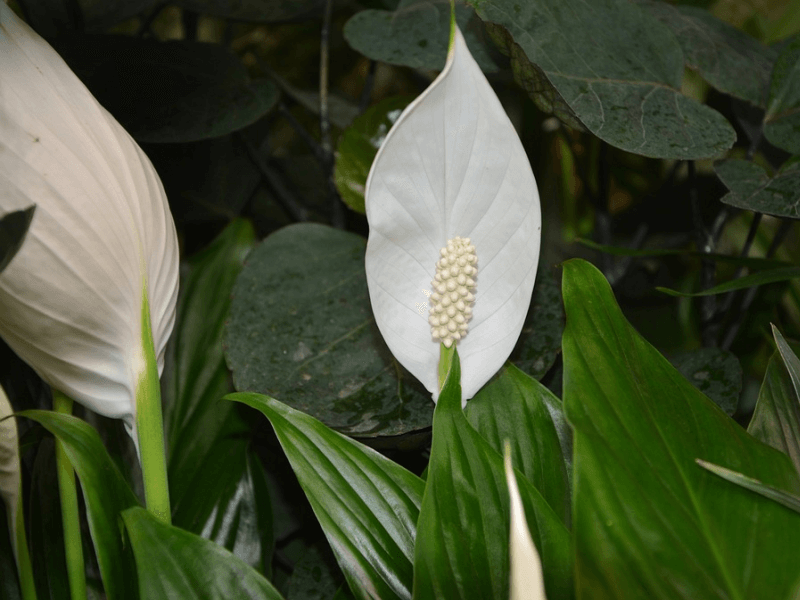 Peace Lilies are mildly toxic to household pets, though the irritation isn’t usually fatal. While re-potting or otherwise handling the plant, you may also find that it will irritate your skin; washing your hands with soap and water usually gets rid of this. Alternative/s: A similar option is Anthurium andraeanum or the Flamingo Lily, which looks a lot like the Peace Lily in form but has flowers of a warmer hue—from bright orange to red. Though it may add more your interior design in terms of color, note that it is not as effective as the Peace Lily in terms of air purification; lacking the ability to filter and remove traces of benzene and TCE, though it still does the job when it comes to formaldehyde, xylene, toluene and ammonia. Like the Peace Lily, the Bamboo Palm has tropical roots and thrives in indirect sunlight; however, it does need regular watering and more maintenance. And unlike our first two plants in this list, a definite plus to this plant is that it is not toxic to household pets! It’s also much bigger. The Bamboo Palm can grow taller than seven feet, so make sure that it’s not in a room with a low ceiling. It’s a slow-growing plant, though; so you will have ample time to move it if you notice that it’s getting too big for your indoor space. Commercially, you will find Bamboo Palms clumped together to form the appearance of a shrub, but you may separate these clusters into about 20 or more individual plants with about 10 or more fronds each. 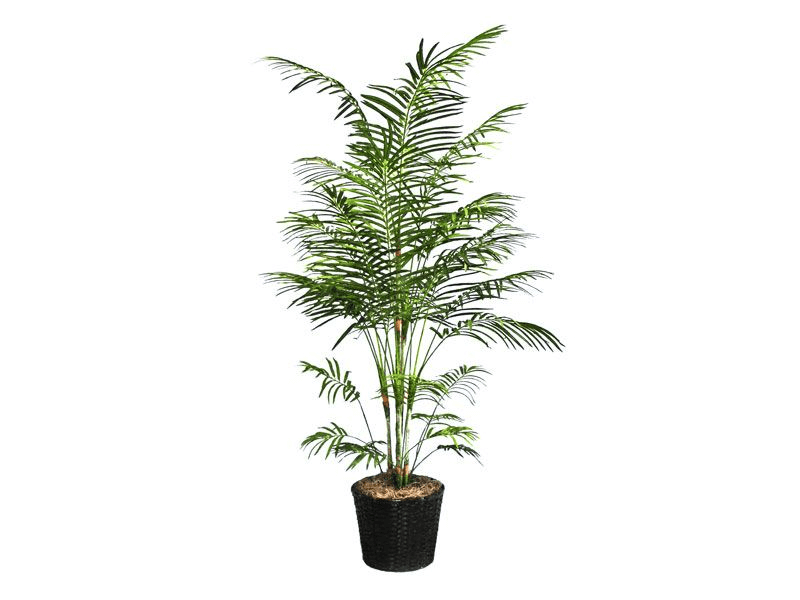 Alternative/s: If you can’t find the Bamboo Palm, note that two other plants that look very much the same are also good for indoor decoration and air purification: Phoenix roebelenii or the Dwarf Date Palm, and Dypsis lutescens or the Areca Palm. Similar to the Flamingo Lily, they can’t help eliminate benzene and TCE from your bedroom environment, but are effective when it come to other toxic agents. 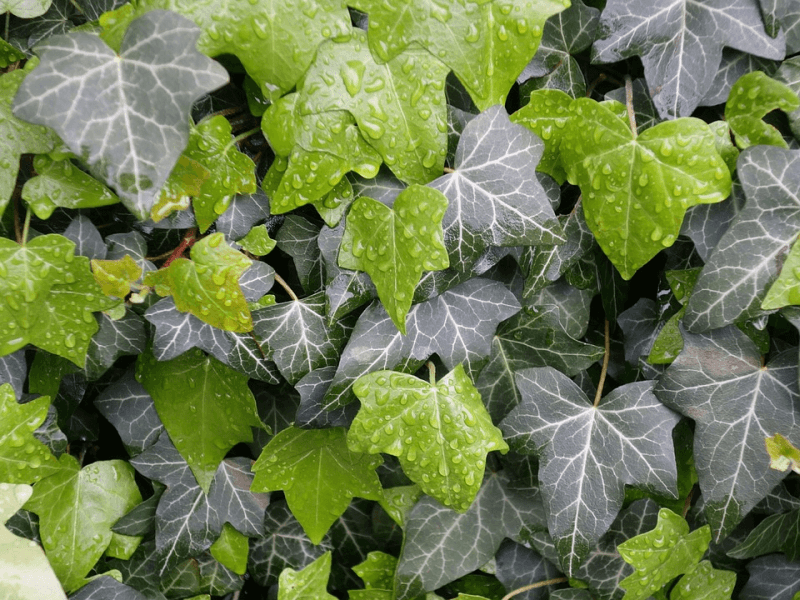 English Ivy helps get rid of trace amounts of most toxic agents included in the NASA Clean Air Study, although if you live in the US you may want to reconsider taking care of this plant; as it is classified as an invasive species and a noxious weed in many parts of the country! It is a rampant climbing vine that spreads easily, and in the state of Oregon its cultivation and sale are actually banned. On the other hand, it doesn’t take much for it to thrive and grow. It needs very little light, but make sure to water and prune regularly; and hang way out of normal reach. Note that while it does flower and bear fruit in the form of tiny berries, these are toxic to pets and humans. Alternative/s: Another flowering vine suitable for indoor cultivation and decoration is Epipremnum aureum or Devil’s Ivy—so called because it seems impossible to kill. If you are partial to hanging plants but want to make sure your bedroom greenery is non-toxic, you can check out air-purifying ferns; particularly Nephrolepis exaltata or the Boston fern, and Nephrolepis obliterata or the Kimberley Queen fern. Like the Bamboo Palm, the Red-Edged Dracaena is a beautiful house plant fit for large areas and high ceilings. Its narrow, ribbon-like leaves are stiff and multicolored—red, green and yellow—and are arranged in a spiky manner, protruding outward. Although it is similarly a slow grower, its height can reach up to 15 feet! Moderate maintenance is needed, as it is toxic to household pets and it does also need a good amount of sunlight for optimal growth. Alternative/s: Another plant in the same genus that is great for indoor cultivation is Dracaena fragrans or the Cornstalk Dracaena—along with its popular cultivars, Janet Craig and Warneckei. The Cornstalk Dracaena survives even with very low levels of light and not a lot of attention and care. 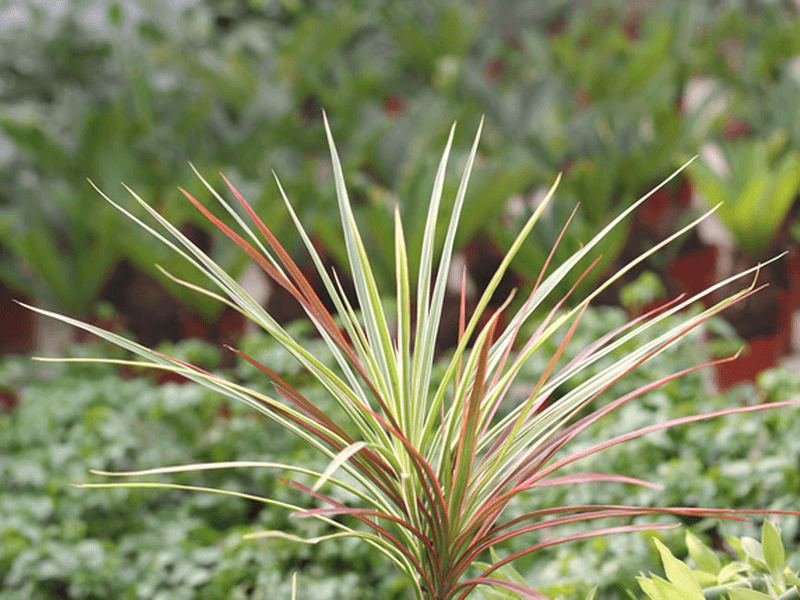 If you are looking for plants that are similar to the Red-Edged Dracaena in terms of its spikiness, you can also check out Chlorophytum comosum or the Spider Plant, as well as Sansevieria trifasciata or the Snake Plant. Both are good air purifiers, with the latter being just as effective as the Red-Edged Dracaena. Note, though, that the Spider Plant is non-toxic.